Time for another update on the squad. Work is progressing steadily and I'm confident the whole batch will be ready for painting by tomorrow evening. So despite my slow painting speed, the squad (and little, extra suprize) will be done in time for the end of the Black Crusade Charity! I've spent most of my time since the last update correcting little mistakes, adding pins between weaker parts (that icon bearer's staff, for example, is thoroughly pinned now) and adding a few extra details here and there. Most of the truly fiddly work has gone into turning those fantasy helmets into stuff suitable to the harsh conditions of the 41st millennium. The main trick used is adding lenses to helmets, a simple visual element (though quite challenging modelling-wise) that makes the piece feel more at home in the unit and also adds a common detail between all squad members. Personally I love the effect, though it does need some further cleaning up. I do really wonder if it will work with the rest of the unit though, something tells me this won't become clear till there is a nice coat of paint on these guys. In case it doesn't work, there's nothing stopping me from replacing the entire helmet after all. Nothing ventured, nothing gained, but also nothing lost in this case. 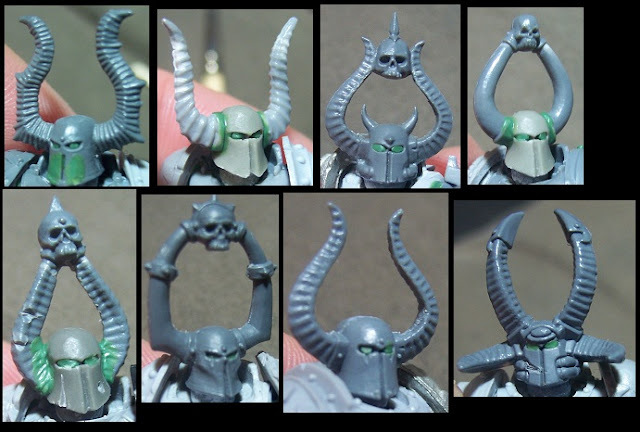 One thing is certain though, I will be adding an extra Chaos Space Marine with a similar helmet to my small collection of Wordbearers somewhere down the line! The second thing needing extra attention was the basing. Originally the plan was to use Secret Weapon Bonefield Bases for the unit (link), which Falk was kind enough to order for me. It seems though that the damned things have gotten lost in the mail, although lost may not be the correct word. Delayed may be more correct, as I'm waiting for 3-4 other packages from people I've regularly dealt with. There's a lot of stuff brewing in the Dutch delivery market and delivery has been hazzy at best these last 2-3 weeks, but I digress. I'm a huge fan of spending extra time and effort on scenic bases, however trying to come up with something that catches the vibe and detailing of MrJustin's excellent bases is challenging. In the end I've gone with sanded down bases, filled with skeletal remains from various sources including Secret Weapon's own Bag-O-Skulls, followed up with some modelling putty and pva glue for addition texture. It will require quite a bit of extra painting effort, but I'm confident that the end result will fit in well with the rest of the grand army. And there's also a silver lining, doing this stuff myself allowed for easier posing of the Thousand Sons and, well, it was quite a lot of fun figuring out what did and didn't work on each base. And that does it for this update, more coming in a couple of days, including more info on the extra, little thing I'll be adding to the army and hopefully some paint-in-progres shots! In addition, I'll also do a bits breakdown somewhere down the line for those interested in finding out where all those random bits and bobs have come from. That just leaves two extra pics of the Icon Bearer and the essential, half-blown up Thousand Sons each unit of Thousand Sons in my opinion deserves and needs. Great fun to put together, challenging to paint, and he certainly helps bring across the idea that these guys will not go down easily! Looking great! 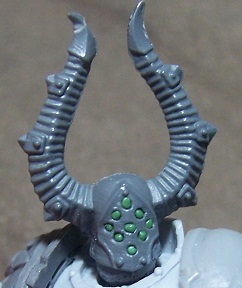 I love using fantasy heads for csm, but never thought about adding gs lenses. Will have to give that a go! It's rather fiddly and time-consuming work, but I think it does help a lot to get away from the usual 'slapped another head on mini'-feel you're stuck with when using Fantasy-themed heads and helmets. OF course it does help that in this case it makes the minis feel even more detached and robotic, something rather suited to Thousand Sons. Your ability to pull the strings of deceit, manipulation and lies marks you with the blessing of Tzeentch himself. Hope you don;t mind me showcasing your squad of con artist in my weekly top-x. Cheers.